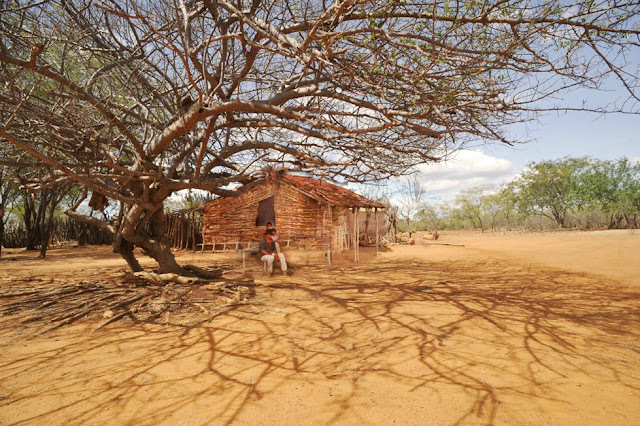 Some regions such as the Brazilian Northeast, has suffered from great evasion, but remains inhabited thanks to the strong and resilient local people. NIMPS and Blemya present here some tips that could help these people suffer a little less. It is noteworthy that the objective of this article is not an attempt to change cultural features and/or interfere with issues of ethnic identity, we simply extrapolate how would these isolated communities be better served by some clever ideas of productivity and low environmental impact. Now, Check out some “almost impossible solutions” for the suffering inhabitants that live in the doughtiest northeastern region of Brazil. The good news for this local humble farm in the middle of the drought is that a group of engineers of Blemya and NIMPS analyzed the scarce local resources and have implemented a number of gadgets to transform the lives of this couple with their two young children. The family new income will be the production and sale of fuel oil from algae, grown in special solar greenhouses. 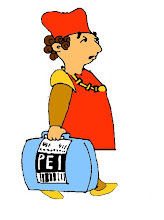 Some of the oil will fuel the 'Alageus' a car designed to run with this oil. 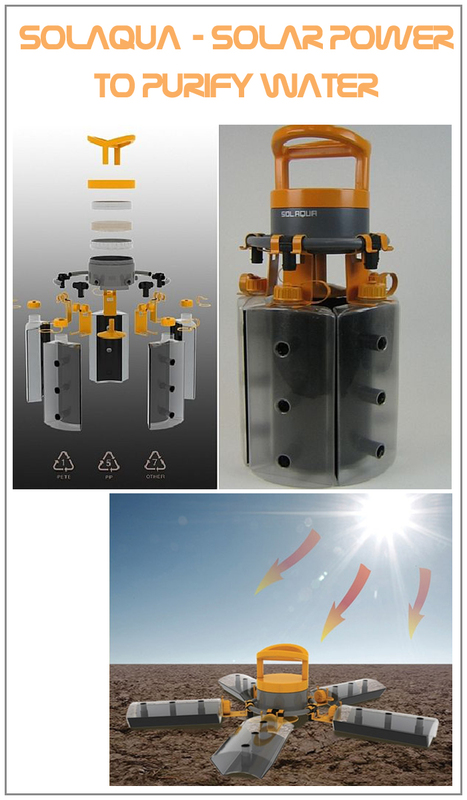 A solar hydraulic pump will draw water from deep artesian wells and will be purified, also with the use of solar energy. 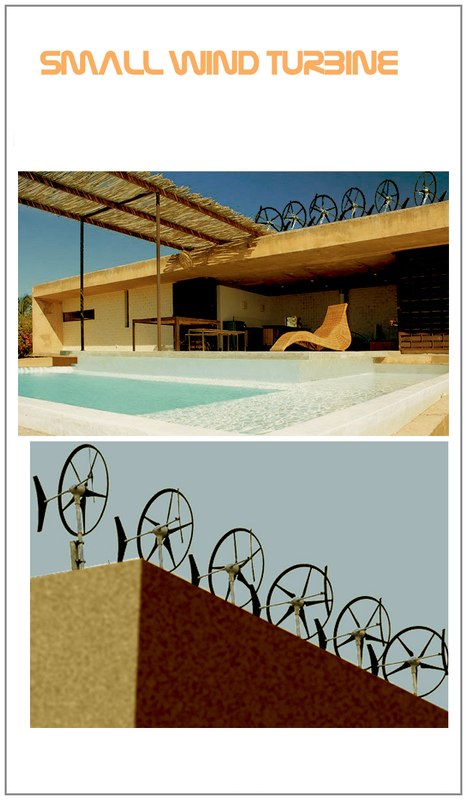 Computers, televisions, refrigerators and all other electrical appliances in the house will be powered by the newest wind and solar power generators. As we saw this humble rural family went from suffering poor to prosperous workers through the use of global intelligence coupled with a willingness to work. Now learn more about these new technologies. 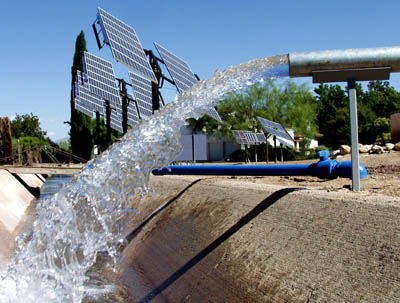 The water pump systems have solar panels (Photovoltaic cells) that move automatically to track the movement of the sun, for maximum efficiency. Water is drawn from the source through a “straw” by a pump that is powered by the solar panels. Jason Lam, a student designer at University of New South Wales, shows a water purifier that uses the power of the sun to make water drinkable. 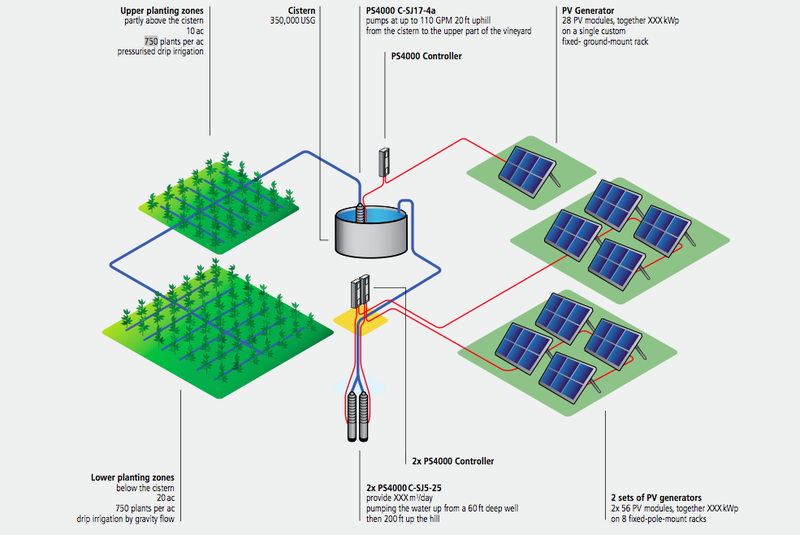 It's intended for places with limited resources where water-borne diseases are prevalent, helping to save lives with the power of the sun. 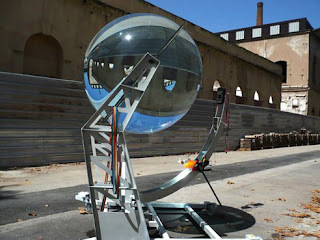 Solaqua utilises ultra-violet and infra-red rays from the sun to eliminate pathogens within contaminated water. Raw water is first passed through a sari cloth filter to improve efficiency of solar water disinfection (SODIS). A five tap funnel fills five specially designed bottles to obtain ten litres of water. By spreading and laying the bottles on the ground, the transparent bottle surface allows maximum exposure to UV rays. The black, back surface of each bottle absorbs heat, while reflective inner surfaces reflect UV rays within the water itself. The design uses plastics, which seems problematic for a device that will sit all day in some very hot sun. 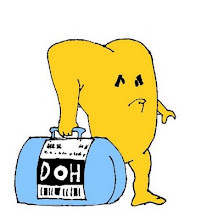 Lam states, though, that plastics were chosen to keep it lightweight so it can be carried to where water is available, and so that each part can be replaced and recycled as needed. That doesn't mean, though, that the parts will be long lasting, which would be a key element to a design going to rural areas. Since algae naturally generates oil in higher amounts than biofuel crops, it was believed algae could be the key to developing a sustainable biofuel. World's first algae-powered plug-in electric hybrid vehicle. Josh Tickellis the creator of the Veggie Van Organization and director of "Fuel," which was honored as best documentary at the 2008 Sundance Film Festival. Tickell created the Algaeus mobile, As the name suggests, it's the world's first algae-powered plug-in electric hybrid vehicle. 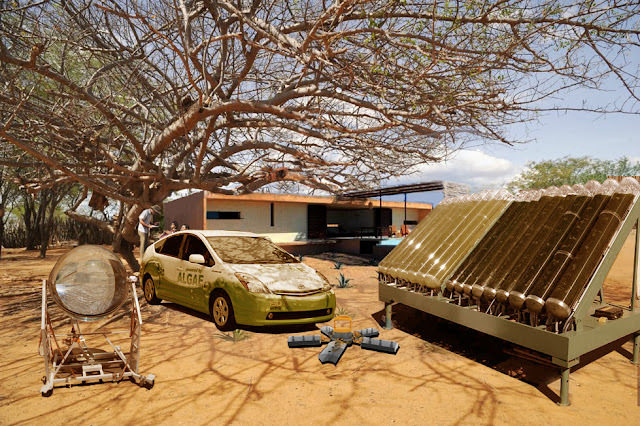 Essentially, the Algaeus is a tricked-out version of the already fuel-efficient Prius. Tickell added a nickel metal hydride battery and a plug to the hybrid car. 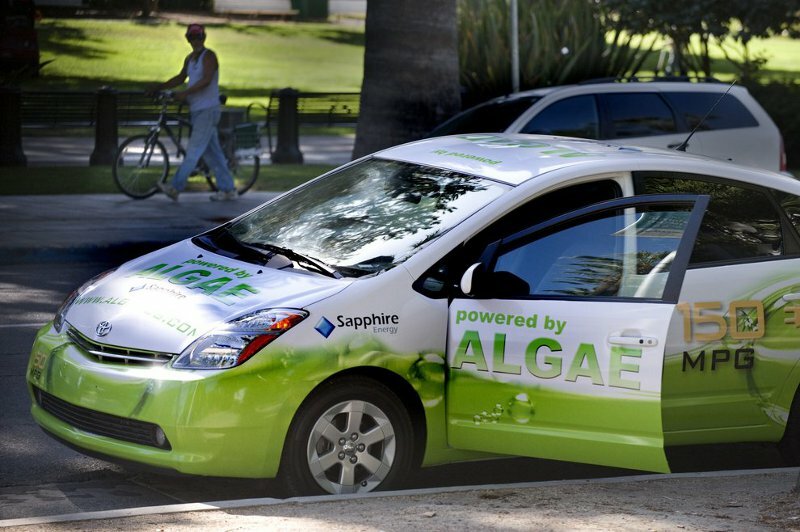 Instead of gasoline, the car's engine runs on algae fuel. The set-up is so effective that the Algaeus can run on approximately 25 gallons from coast to coast. 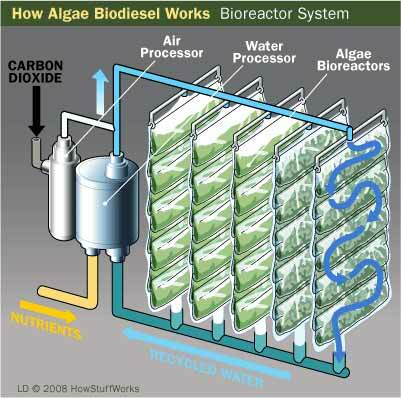 Developed by the green startup company Sapphire Energy, algae fuel is produced on a farm in the deserts of New Mexico. Proponents of algae fuel claim that it has the potential to be a new source of 100 percent carbon neutral energy that won't require changing the country's current energy infrastructure.. Here is desert house with low maintenance based on the ones designed by Gracia Studio. This house featured with outdoor swimming pool and opened living room. The materials used in their construction are carefully chose to withstand hurricane and also need a minimum maintenance. Basically the house is one open floor plan for the common areas and the bedrooms are more enclosed to have privacy. Both houses have similar structure. It is composed of concrete matching the natural color of the local dirt. Some walls are covered with “talavera” in order to bring a traditional “Nordestina” architecture into its design. The floor plan is very easy and flexible because of the linear structure of each house. The simplicity of the floor plan matches the simplicity of the design of the exterior making the place perfect for enjoying the nature.